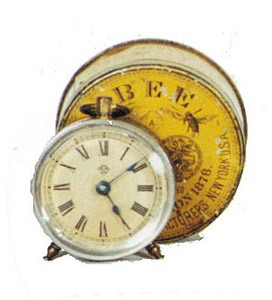 Ansonia Clock Co. novelty, "Bee" in original yellow tin shipping container, ca 1906. Winds by turning the back, no key. One day time only, running. Nickel case is 3 inches high, beveled glass. Clock and rare tin can in excellent condition. Ly-Ansonia No.2291.